Last week, I went to the local art supplies store, looking for some craft stuff. While there, I looked around and I saw something interesting on a shelf : a box marked CaligraphInk Fountain Pens. 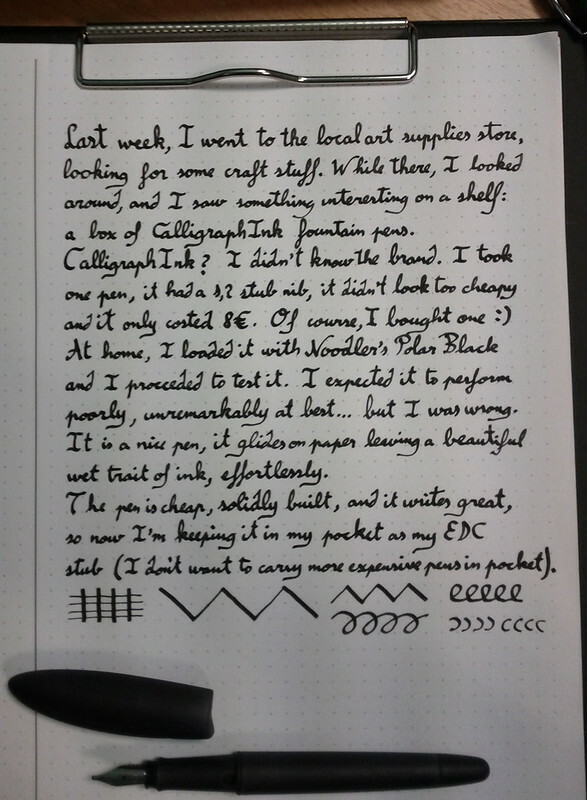 At home, I loaded it with Noodler's Polar Black and I passed to the test. I expected it to perform poorly, unremarkably at best... I was wrong! It's a nice pen, it glides on paper leaving a beautiful wet trait of ink, effortlessly. The pen is cheap, solidly built and it writes great, so now I'm keeping it in my pocket as my EDC stub pen (I don't want to put more expensive pens in my pocket). I've also posted this review on Fountain Pen Network.